Challenge Cup winners Nottingham Panthers have been accepted as the only British team to compete in the inaugural Champions Hockey League. With Elite League winners Belfast Giants unable to compete, Nottingham take their place as a wildcard entry. The Panthers are one of four sides added to the expanded 44-team European competition starting in August. 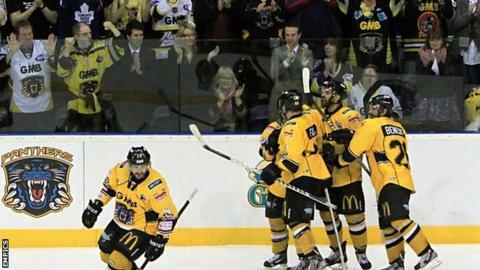 "Our inclusion is great for the sport in the UK," said Panthers general manager Gary Moran. "It will be exciting for our fans and it is a great honour for our club to once again fly the flag for our league." Nottingham made it to the semi-final stage of the Continental Cup, winning four and losing two matches in two separate group stages. The Panthers failed to make it to the Elite League play-off finals weekend last season, but ended Belfast Giants' hopes of earning a Grand Slam of trophies by retaining the Challenge Cup with a penalty shootout victory in March.